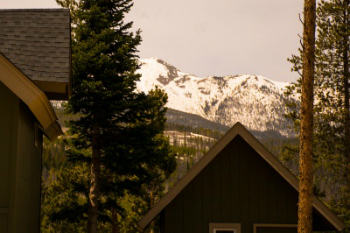 The Gold Hill homes for sale lie in the geographically large neighborhood north of Breckenridge, on the west side of Highway 9. 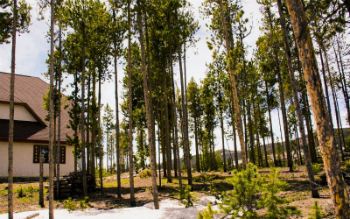 It is situated across the highway from the Breckenridge Golf Course, and directly north of a popular trail that climbs Gold Hill. The neighborhood is a long-established one, which has kept a rural character. The roads are mostly unpaved, all the home sites are roughly one-half acre or more, and some accommodate horses. If you want more information about the neighborhood you can keep reading, or start searching active Gold Hill real estate listings directly below. The first homes in Gold Hill were built in the 1960’s and several were intended to be small, summer cabins. Since then, development has been one by one, custom-built homes in a variety of styles. The neighborhood is not inside the town limits of Breckenridge and was not always served by the town water and sanitation district, so many homes will be on well and septic. A popular single-track trail runs along the south side of the Gold Hill neighborhood for about three miles from Highway 9 to the Peaks Trail, and is popular for hiking, mountain biking and cross-country skiing. 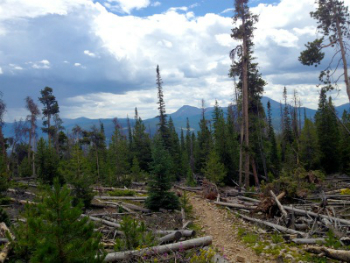 This trail rises to a height that affords a great view of the northern part of Breckenridge, and joins the Peaks Trail, which goes along the base of the Tenmile Range from Breckenridge to Frisco. The Gold Hill trail is part of the linked route, called the Colorado Trail, that makes it possible to hike from Denver to Durgango. A public 27-hole golf course is across Highway 9 just a short distance from Gold Hill, and is a public groomed Nordi ski center in the winter. The Swan and Blue rivers are within walking distance for fly fishing, and the county-wide bike path is at the foot of Gold Hill running parallel with Highway 9. Size: 952 sq. ft. to 3232 sq. ft. Amenities: rural, open lots, close to Frisco and I-70, trails, river access, bike path nearby. Size: 2822 sq. ft. to 4939 sq. ft. Size: 1452 sq. ft. to 3697 sq. ft.
Coming from Frisco, turn right before reaching the Breckenridge Golf Course on Gold Hill Road, or coming from Breckenridge, just north of the course, turn left on that road. A trailhead and parking lot bookend the first few feet of this road and after a few turns the many homes of this subdivision appear, and the road continues for several miles. We'd be happy to show you around Gold Hill, or any other Breck neighborhood. Send us a message to get in touch with one of our knowledgeable agents today!